Nearly every fruit can be made into an upside down cake, it’s such a simple way to enjoy fresh fruit and cake simultaneously. 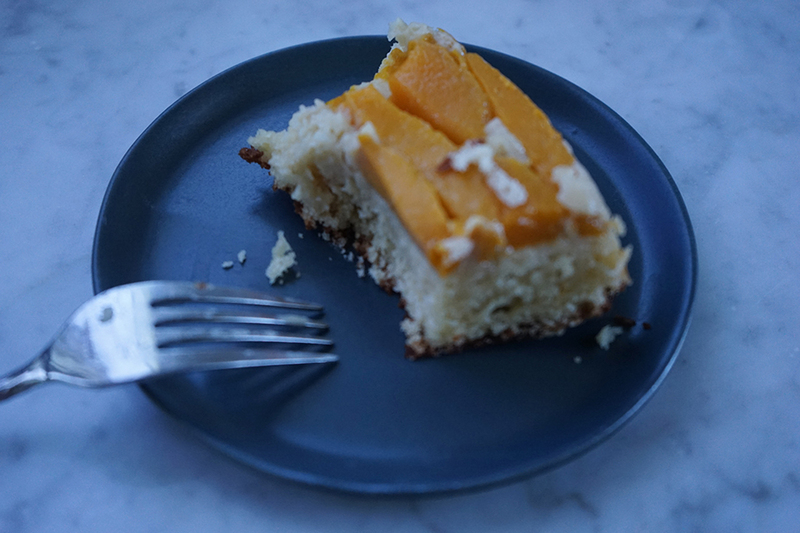 Mangoes are perfect for this cake because they give it a beautiful, vibrant color and add a natural sweetness, which allows for a less sugary cake batter. 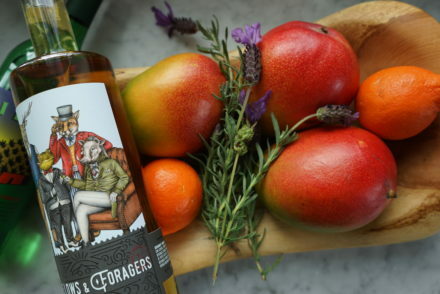 The perfect balance of tart and sweet. The perfumy aromas of mangoes are intensified when baked, and thus this experience is like aromatherapy. I prefer a cast iron skillet for this recipe (and, frankly, for all my upside down cakes). I feel that the fruit has a more caramelized flavor and texture when I use this kind of pan. 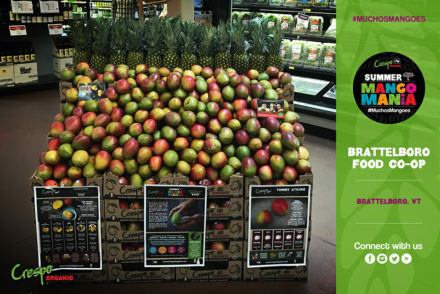 When using a well-seasoned cast iron skillet the fruit tends to release itself from the bottom of the pan with greater ease. I don’t really have a mango preference for this cake. Ataulfos and Tommy Atkins, which are both plentifully available, work just as well. 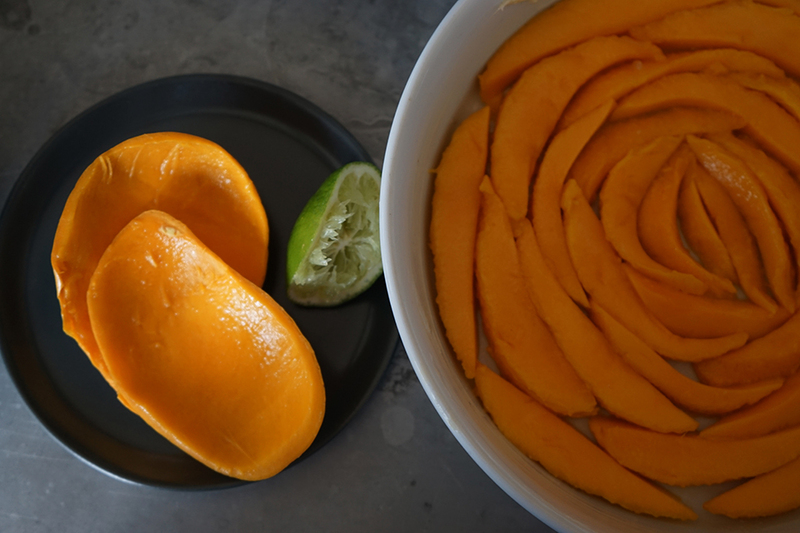 I like to use a semi-ripe/ripe mango that still has a little give, not sloppy like a totally ripe mango (although those can be used here too). I like to cut the mangoes in wedges or spears, like I would cut pears or apples for a pie. They arrange into a really nice spiralized pattern when they’re cut like this. But, truly, the beauty of an upside down cake is that there is no rule of thumb. I can’t say I ever saw one that I didn’t think was beautiful, even with a more rustic look, so I think chopped or cubed would work well too. Adding peach (mangoes and peaches are one of the most heavenly combinations) or pineapple is fun too. I love this recipe served with a coconut crème fraîche (it makes me feel like I am in a tropical paradise!) but on its own the cake is divine, as well. It’s a really simple recipe that isn’t too time-consuming and is truly near impossible to mess up! Preheat the oven to 350° and make sure the rack is positioned in the middle of the oven. With the tablespoon of butter, generously grease a 9-inch round glass baking dish. 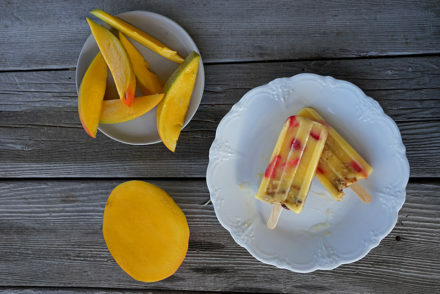 Cut the cheeks off the mango and using one of Crespo Organic‘s #ChooseYourCut techniques, slice the mango cheeks into long wedged segments or fingers. 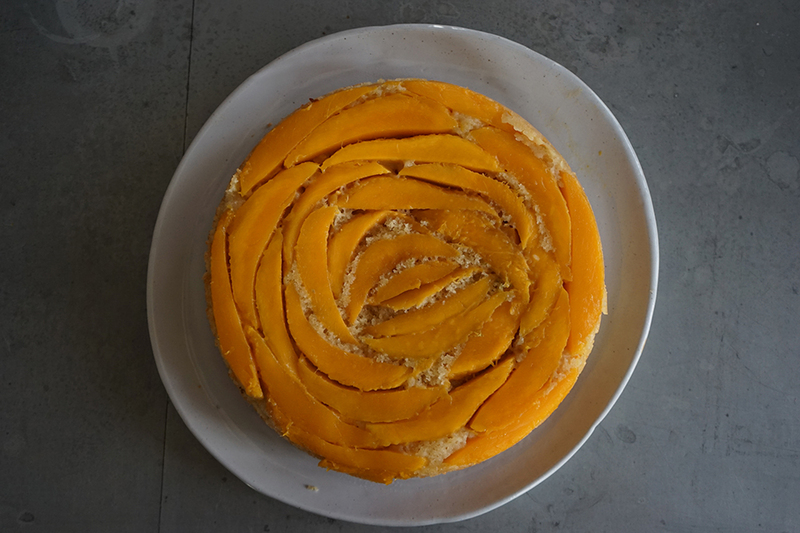 Arrange the mango slices, starting from the center of the baking dish in a spiral or rose configuration, making sure the mango segments are laying flat and fairly close together. 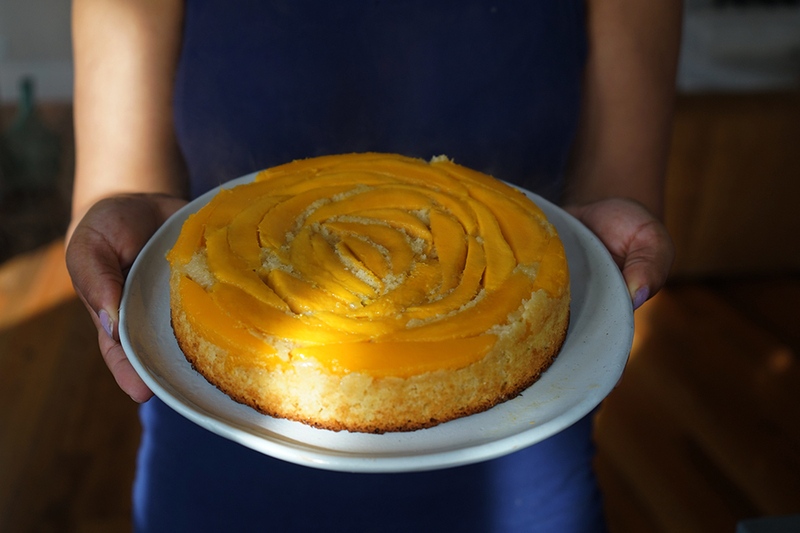 Set aside the baking pan with mangoes and prepare the cake batter. Cream together butter, sugar, eggs, vanilla, lime zest, juice and milks using a whisk or an electric mixer, until a smooth and fluffy consistency is formed. In a separate bowl mix together the flour, baking powder and salt. Add the flour mixture to the creamed mixture about ¼ cup at a time, stirring gently with a wooden spoon or electric mixer on slow. Once all the flour is incorporated, gently turn up the speed on either your arm or your mixer for a few short spurts, allowing the batter to become smooth, but being careful not to overmix it. Gently pour the batter over the mango slices arranged in the baking dish, laying it out evenly but not disturbing the mangoes. The batter will settle as it cooks so don’t spread it tightly to the ends of the baking dish. 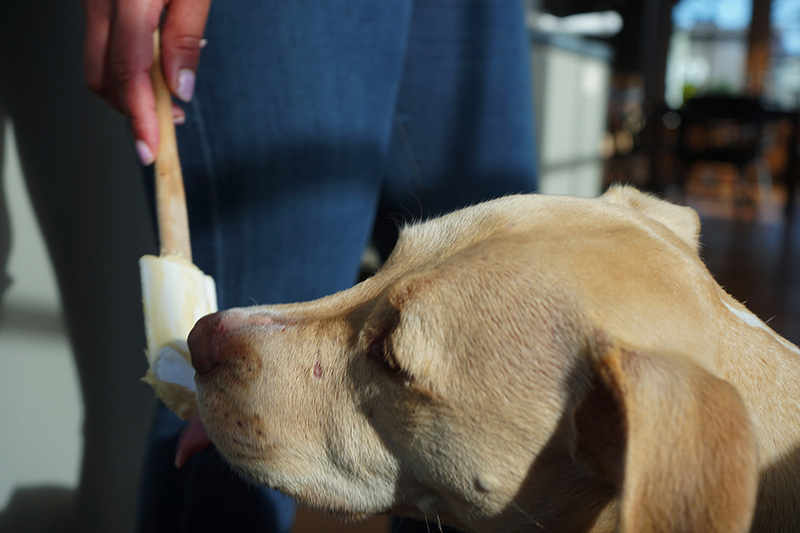 Bake for about 30 minutes or until an inserted wooden stick or knife tip comes out smooth. Allow the cake to cool for about 5-10 minutes. Take a sharp, thin knife and cut along the edge of the cake pan making sure none of the batter is stuck to the sides. Invert the cake onto a flat plate or small cutting board, and gently tap on the bottom of the pan to release the cake. In a small bowl gently whisk together the crème fraîche, lime juice and zest, coconut milk and vanilla into a velvety cream. Fold in the toasted coconut and serve atop the mango upside down cake. A little lime zest at the top adds a pop of color!